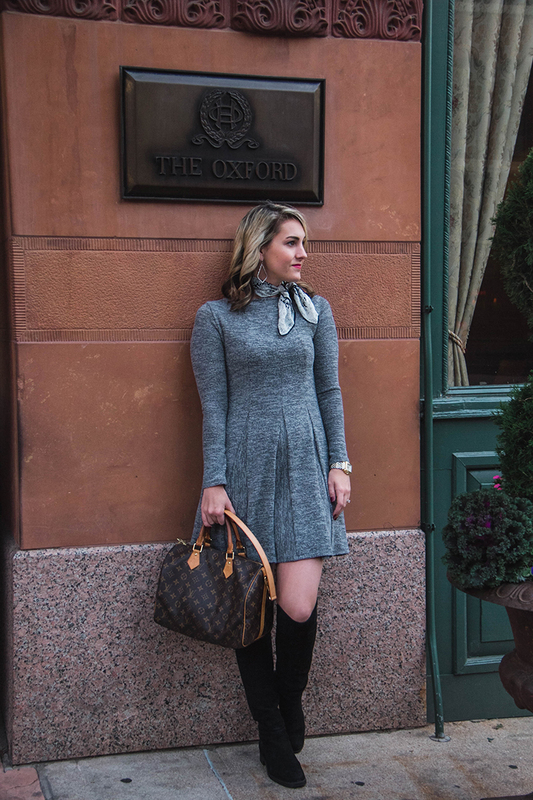 K: Brandon and I were fortunate enough to have a media rate at The Oxford Hotel, giving us the opportunity to photograph and experience Denver’s most historic hotel. 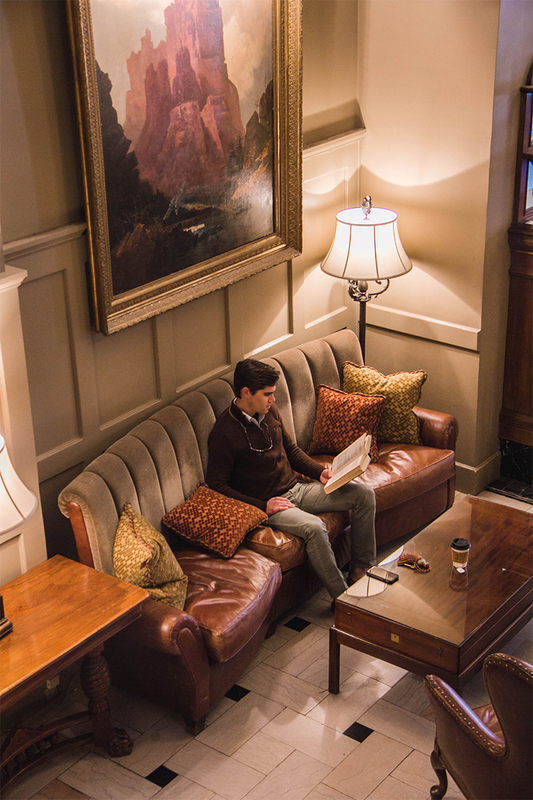 Opened in 1891, the Oxford has a timeless flair, seen through the antique furniture in the lobby and notable works of old art; however, it has been newly renovated with contemporary bedroom furniture, marble detailing, and a fabulous martini bar inside of the hotel. We loved the fact that this hotel managed to bridge the gap between the old and the new, all the while, holding onto its important history. B: After going nearly all week without tea, I was thankful to find a self-served selection of teas in the Oxford Hotel for a quick dose of caffeine. It definitely brightened our mornings, as did many of the other qualities and charms of the hotel. 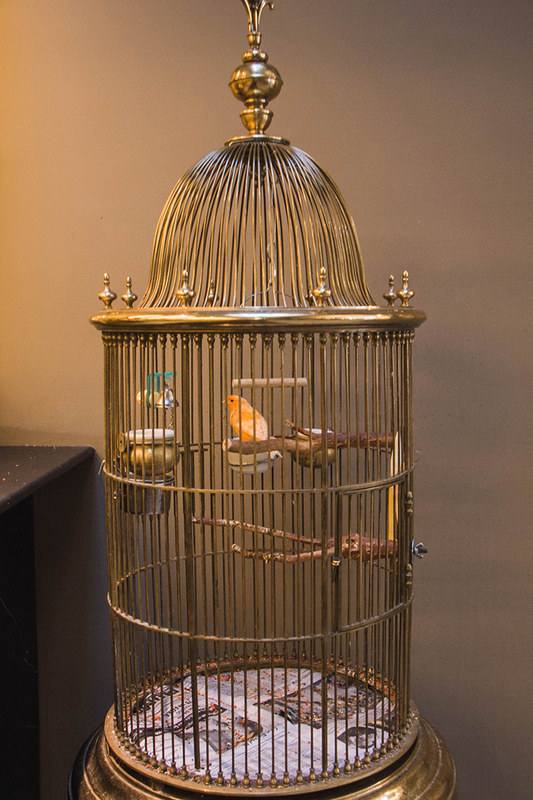 Upon arriving at the Oxford Hotel, I first noticed and examined an orange sherbet colored finch named Sherman. My mind immediately raced to the old concept of the cannary in a mineshaft, and Rachel Carson’s Silent Spring, reminding me of Colorado’s rich mining history and diverse ecological story with a patchwork of various biomes. Subtle little things like this allow me to retain profound memories. No matter if it is the color changing aspen leaves at 10,000 feet of elevation, or a petite bird in a beautiful hotel, the object makes the memory, which gives meaning to the trip. The most stunning aspect of this hotel for me was not the collection of antique paintings, books, and furniture, nor the beautifully remodeled interior and preserved exterior, and not even the wine bottle shapped martini bar built in the image of the Queen Mary Ship in the wake of an abolished prohibition. Nope, it was the basement restrooms of the Oxford Hotel. I know that sounds strange, but Katherine agrees with me; the old bathrooms are stunning. The antique porcelain vaneer toilets and urinals are a work of art in themselves which are seperated with thick cut marble stalls. Moreover, the sinks and mirrors look as though they could tell amazing stories from the turn of the century if they were afforded lips. K: Avelina is the sister restaurant associated with The Oxford Hotel and they invited us to dine for dinner. Brandon and I were so thrilled at the opportunity to eat at this modern restaurant, known for their New American cuisine. 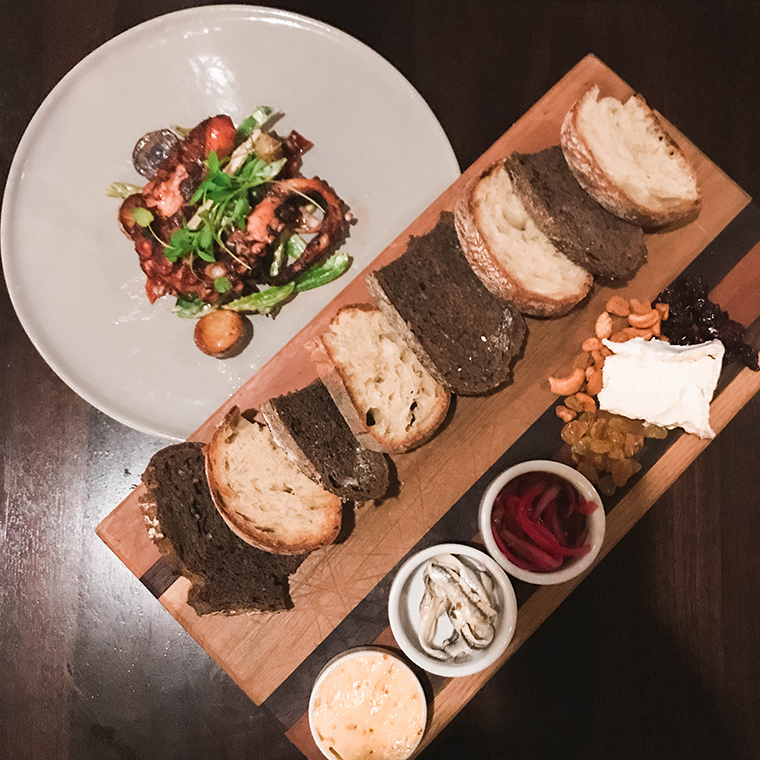 We started out the meal with cocktails and the Bread Board plate (pictured below). Avelina brings their bread in fresh from a local supplier and it was absolutely delicious. Next, we were pretty much forced to try the charred octopus and our friendly waiter vowed that we would not be disappointed. Brandon and I always take any suggestion from a waiter and this was no different. He was right. We devoured the octopus and I’m usually not one for exotic seafood. We split the sea bass for our main dish and no surprise, we ate it all. Coupled with a beet risotto, and we were in complete foodie heaven. Our waiter, Jackson Brown, suggested a chocolate hazelnut dessert and especially after the stellar octopus suggestion, we quickly said yes. 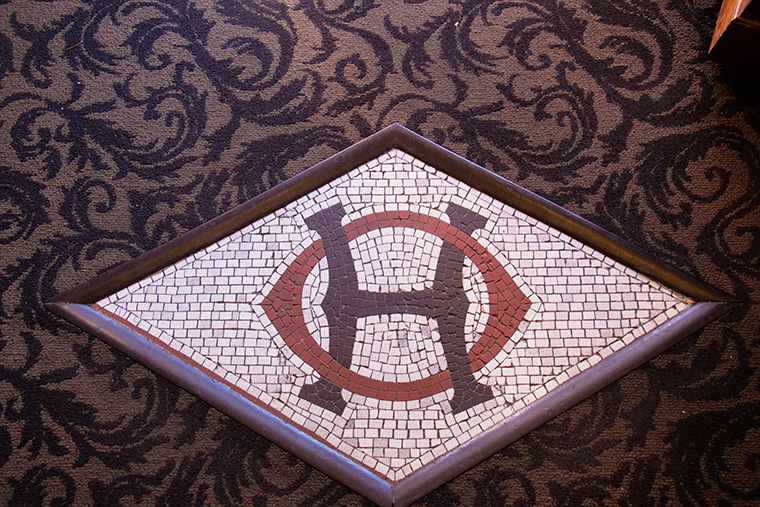 We cannot recommend this restaurant enough! 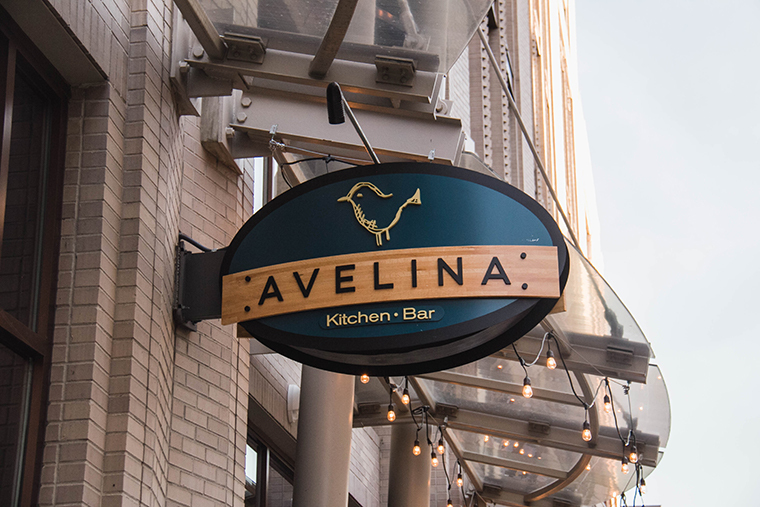 If you’re in the Lower Downtown Denver area, you must add Avelina to your list! B: Avelina harbors a truly historic location nestled within the skeleton of an old bank building. In fact, the extremely personable owner was able to share her story of the inspiration and creation behind this popular restaurant, bar, and social setting. A well rounded restaurant staff always catches my attention, and Avelina ranks near the top for professionalism and friendliness. It also does not hurt that the food at Avelina was fresh, mostly local, and arrived at the table with great presentational flare. 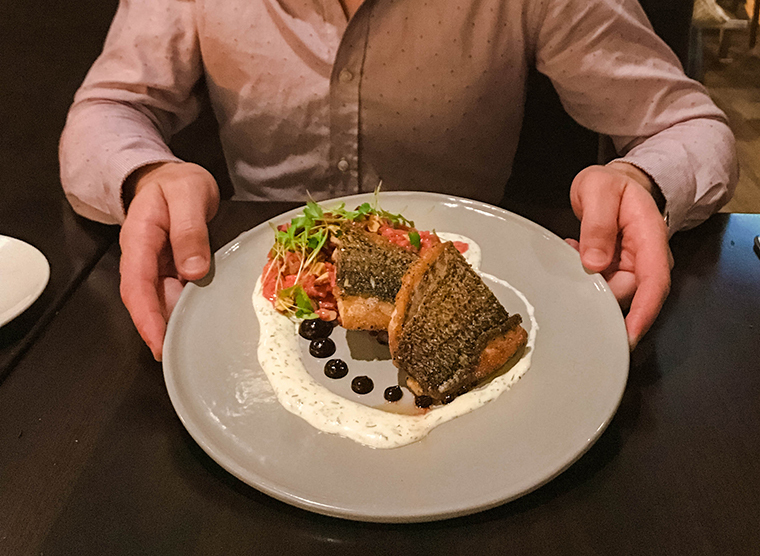 I love to find restaurants that are not stereotypical of their particular geographical setting, and after eating out all week in downtown Denver, this solitary restaurant made me feel as though I could be in any American city because of the diverse cuisine. 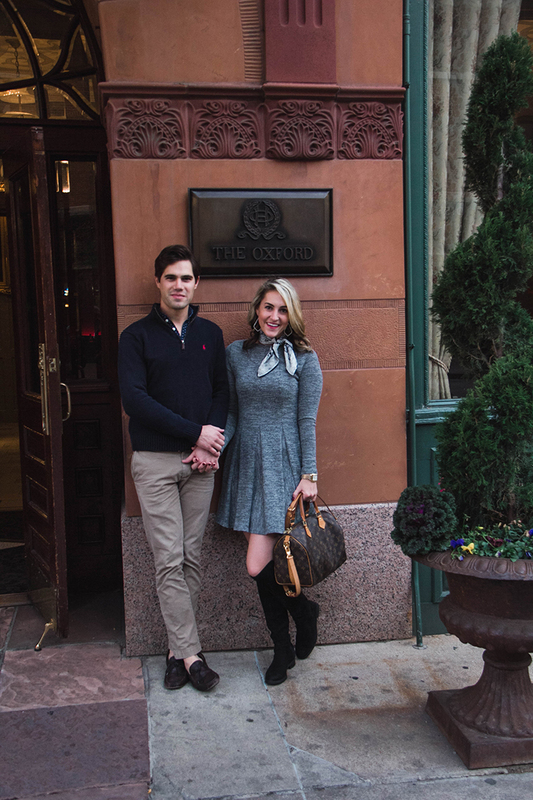 If you are planning a trip to Denver, we’d definitely recommend The Oxford for two major reasons: the location is prime and service is excellent. It’s always a bummer to arrive in a new city, only to find out that your hotel is far from “the good stuff”. This was not the case for us in Denver. 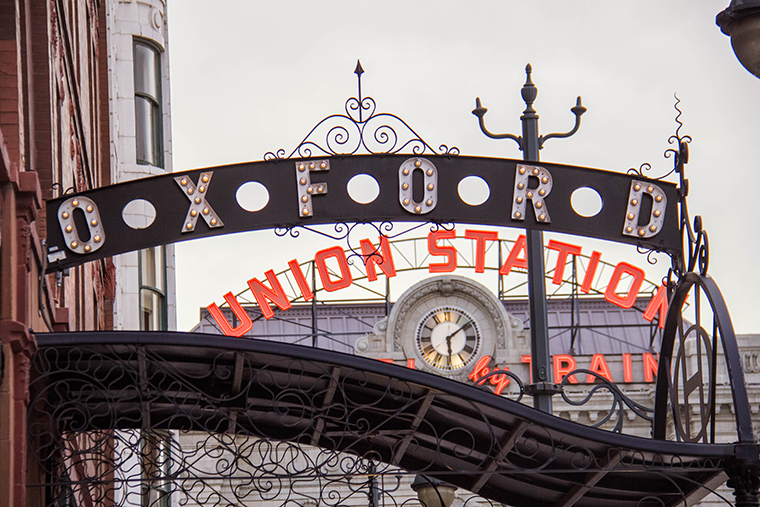 The Oxford was just a couple of blocks from the free public transportation of 16th Street Park Mall, one block from Union Station (where you can catch the train), and right next to hundreds of amazing Denver restaurants and shops. 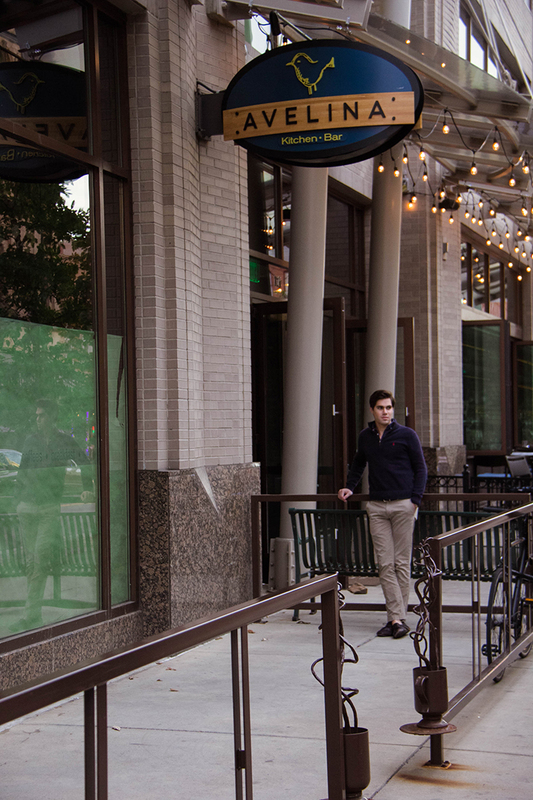 We’d definitely say they had some prime real estate, nestled right in the middle of Lower Downtown. The room size was average with plenty of space for us to lay our suitcases out (a necessity for bloggers!). There was even an antique armoire in the corner that served as our closet to hang things. The only small space in the room was the bathroom. 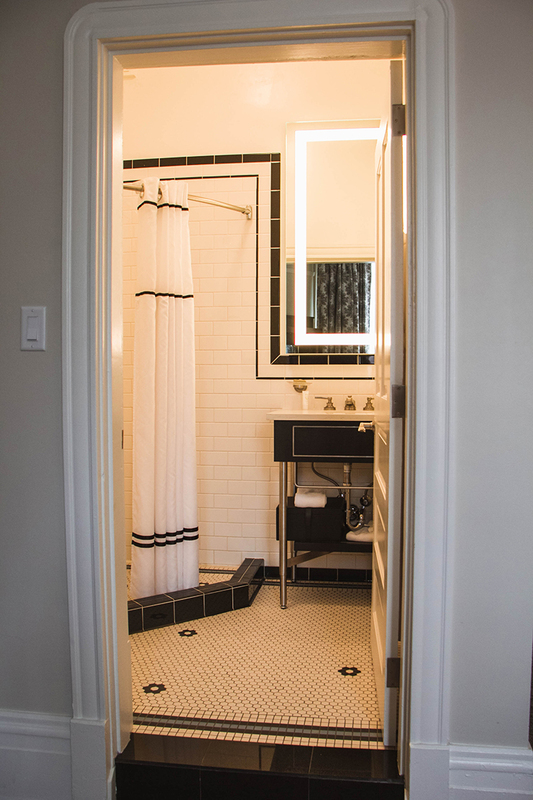 Though beautifully designed and renovated, this was the one area where we could’ve used a little extra space. As mentioned before, the decor manages to bridge the gap of modern and antique. 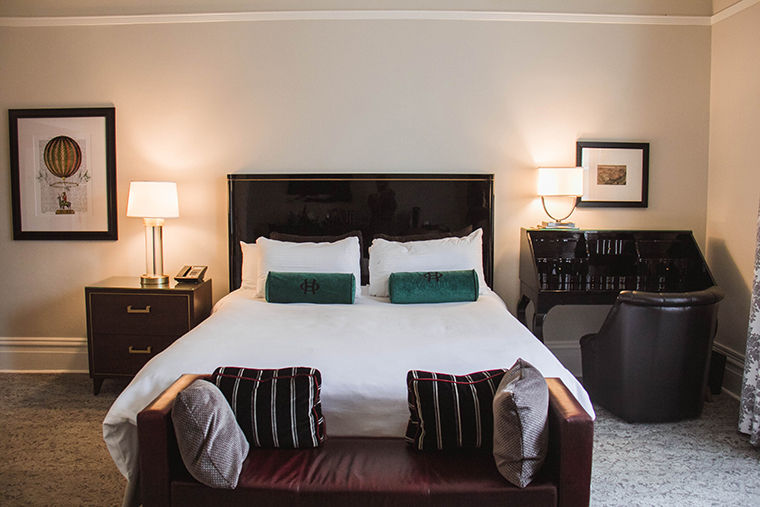 The hotel rooms themselves have mostly new furniture with several intricately placed historic pieces, while the lobby holds true to the older roots of The Oxford. We absolutely loved all of the decor and found that it was a fun place to photograph. There is a bellman and doorman always on duty and we had zero complaints about the overall service. 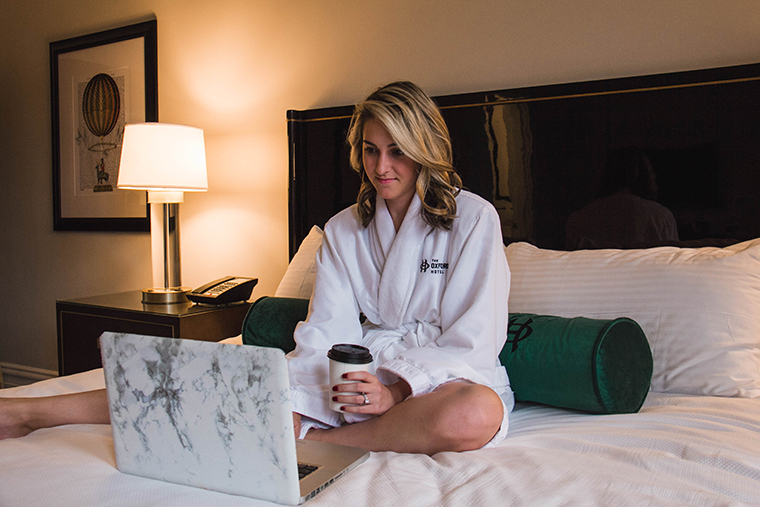 The Oxford is a place that immediately makes you feel welcome and at home. We even had the luxury of a noon check out time, something that chain hotels cannot always accommodate. 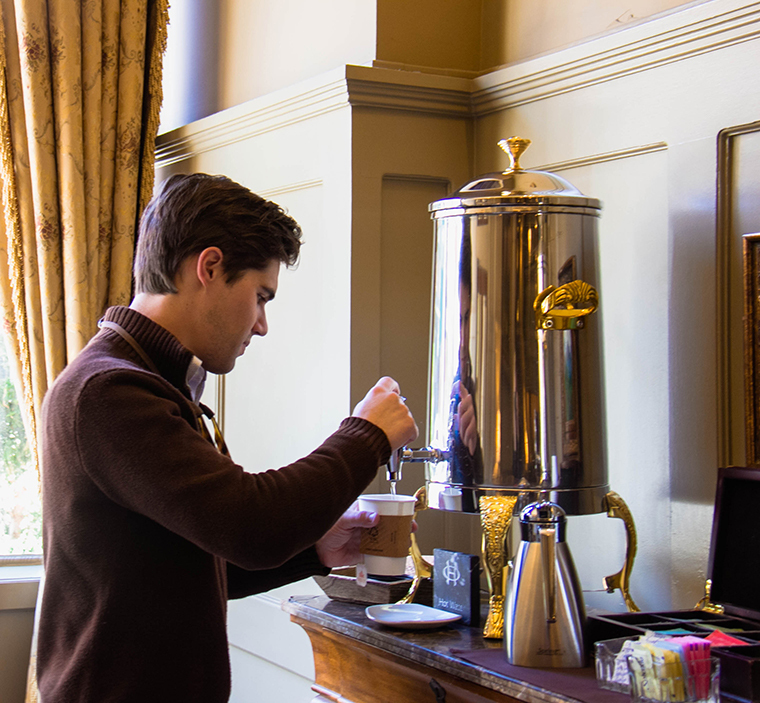 It was fun to have a complimentary tea and coffee bar in the hotel lobby, especially during the chilly mornings. Brandon and I would always grab a cup (my favorite was the hot cinnamon tea, his the English Breakfast), and then head out the door for our morning adventures. Another little “extra” that we enjoyed were the verbena bath items like the shampoo and body wash. This scent was heavenly for both guys and girls and it made our shower experience lovely.